Everybody has experience of condensation indoors and most have a rough idea of the process involved. Evidence of materials damaged by excess moisture or lack of moisture are all around us and the result is due to their surrounding air conditions. Most people do not really understand how moisture in the air can be managed to our benefit and that includes many in the air conditioning industry! My windows had condensation on them this morning. The conditions outdoors were foggy , 6.5 degrees c and 100% RH. The indoor air temperature was 18 degrees c and 70%RH so I opened the windows for an hour. Many people would be confused by this behaviour! The intention was to exchange high moisture content indoor air with lower moisture content outside air, which, when heated, will result in a lower indoor relative humidity. 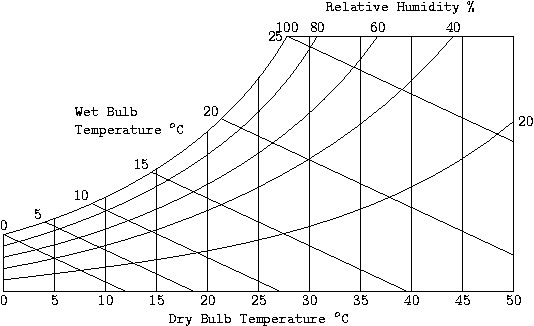 An Psychrometric Chart is a handy tool which shows graphically the parameters to water moisture in the air. So what is the ideal level of humidity in a room? Scientific studies have shown that the ideal range of indoor humidity is 40 – 60% RH. In my experience, people are happy between 30% & 70%RH. But many people sit in rooms at 20% in winter without realising the source of their discomfort. In summer, 75% can be described as ‘close’ even at a temperature of 25 deg.c. As you can see, fresh air can be too dry in winter, once it is heated and in high summer, so humid that it is uncomfortable and adds to the fresh air cooling unit size and running costs. 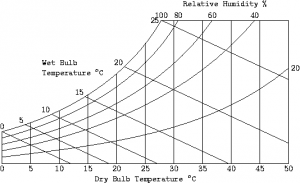 So how do we control indoor humidity? You can buy domestic “humidistats” and some MVHR units come with humidity sensors built into their controls but all of them are unsatisfactory for various reasons. Only specialist companies can offer accurate humidity control. This problem leads to ventilation systems being specified with uncontrolled humidity and only a few special applications demanding it. Following techniques used for environmental chamber control, NEATAFAN have developed a new inexpensive humidity controller that works differently to the existing methods. It can be used in a room to control a humidifier and/or a dehumidifier, or it can be used in the fresh air duct to reduce the airflow in unfavourable outdoor conditions. In both cases helping to keep the room between 40 & 60% RH. Storage of old books and historic cars require an environment that has an even temperature and low humidity. This is usually achieved with desiccant wheel in an Air Handling Unit. The piano and other wooden furniture can be damaged by a room that is too dry. Winter air needs humidifying and over cooling in summer must be avoided. The humidity controller can be used to protect sensitive objects.